I started the first Time from Zadar, so we use the Day before we start to explore the City to find Food Store, Bars and Restaurants. We drive with course to Sebinik, but the Wind is to low. The Weather was changing so decided we to drive to Murter. In the 2.th line find we a good local Restaurant. 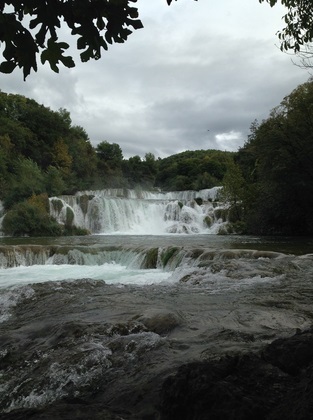 We start to the Nationalpark from Krka. Through the Canyons from Krka drive we to the Harbour and visit the Waterfalls with the last Ferry. The Waterfalls are very beautiful and when we have more Time at our next Visit can we walk around the Waterfalls. We start early in the morning with course to Strupida. In the Midday find we a nice Place for a break, to eat Lunch and swimming and relaxing. At the Afternoon find we a place for Anchor mooring on Isle Skepica. The Owner from the House invite us to eat with him. What a warm hospatility. We start to Zut with a very good Wind. We cooked the first Time on the Boat chinese Food, very delicious. 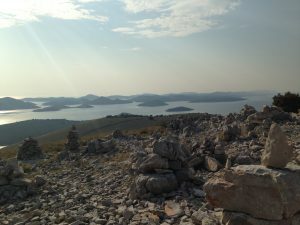 We walk on the top of the Mountain and have a amazing view over the National Park. The next Target is Veti. The Wind was very low, but we find a nice Anchor Bay for the Lunch. Last Day on Sea, but we don’t have Wind. We enjoy the Time to swim and relax. In the Afternoon are we in Sataniscria.